One week until mid-term! Time to ask questions and get ready for next week's test. Adam and I worked on our test weld. For this, we weld 2 3/8 inch plates together. Each side has a 45º bevel. We cleaned these up with a grinder to remove any scale and rust. And then spaced the bevels ¼ inch apart and tack welded them a backing bar with a MIG welder. 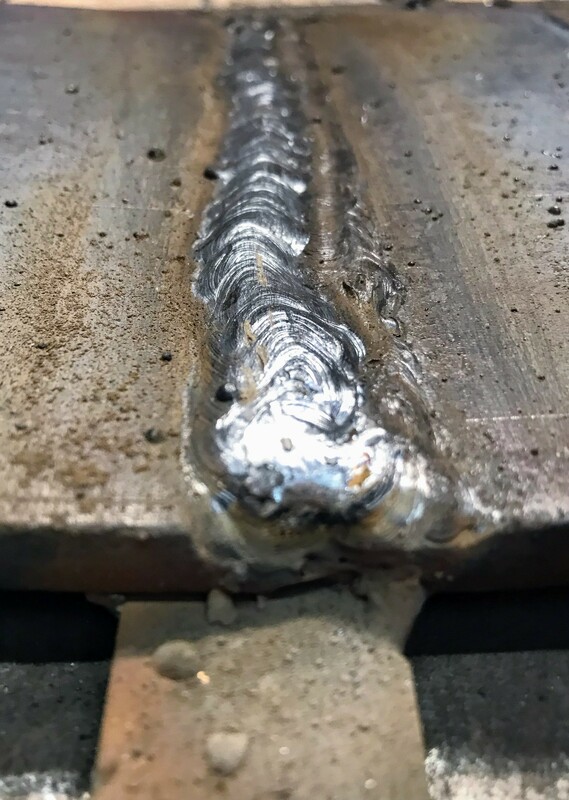 The first bead is called the root weld. 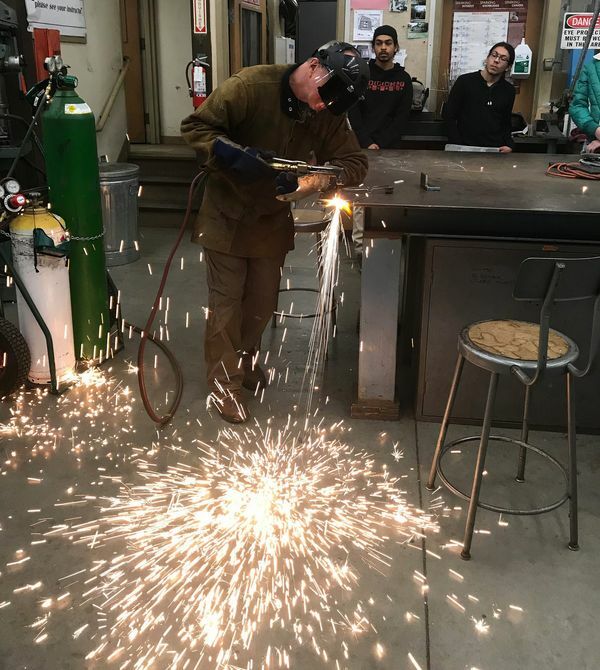 To ensure good penetration you set the amperage on the stick welder to 130-135 Amps. 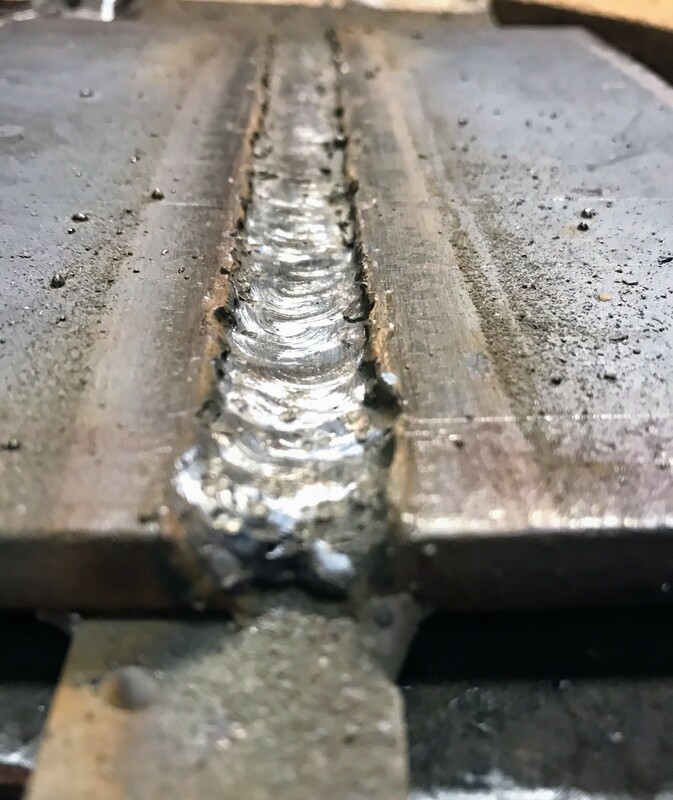 After the root weld, it is time to fill the gap with subsequent beads. 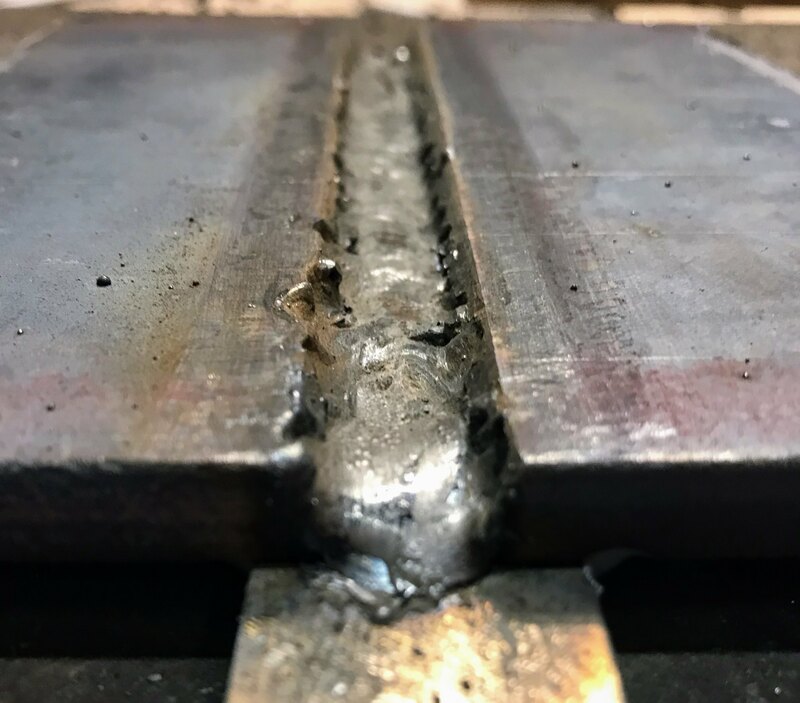 I almost completed the weld. Next week I'll take care of the few low spots and the occasional undercutting. When that is done, I can cut the backing bar off with a cutting torch. Then grind the weld flush with the metal plates. At this stage, I have to cut 2 1" slices across the weld. 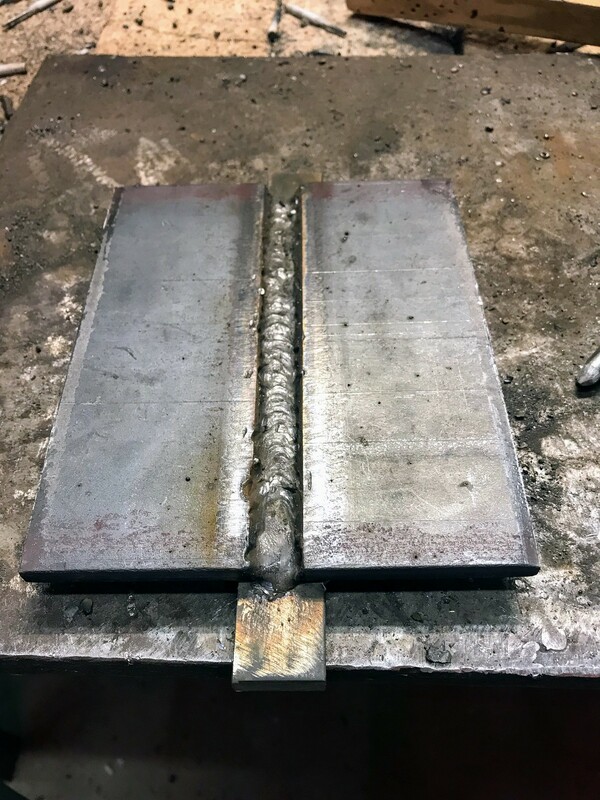 These I then bend ~80°, one with the root pass on top and the other with the filler welds on top. If all goes well, no (hairline) cracks show up and I'll pass the test. Tatyanna and I laid out a spiral for the new lavender field Sunday night a week ago, in the dark by headtorch light. 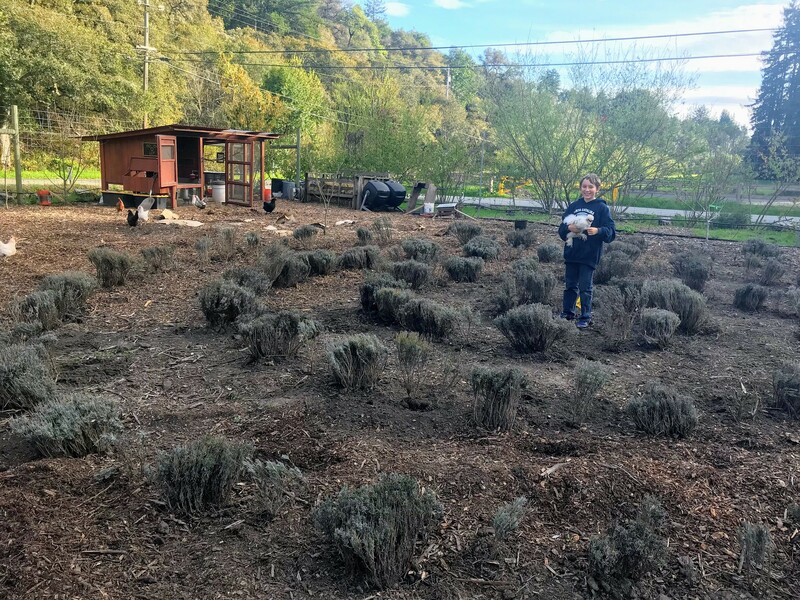 So that Tatyanna could transplant the lavender the next day with her garden helper. Right before the rains started. 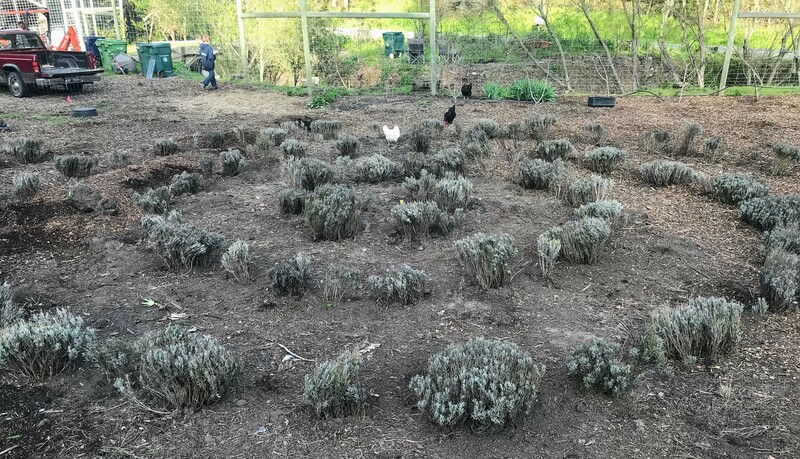 This past Monday, the two of them completed transplanting all lavender and the spiral labyrinth is taking shape. By summer the plants will have grown and be in bloom. Can't wait. Treehouse, is a Cannabis dispensary that took over the mattress store location on Soquel Drive after they folded. Treehouse is only a block away from the beginning of our road. And on Saturday we paid it a visit. The place has a modern look and is staffed exclusively with young punks. Security cameras everywhere which the one security guard monitors on his tablet while he roams the store. 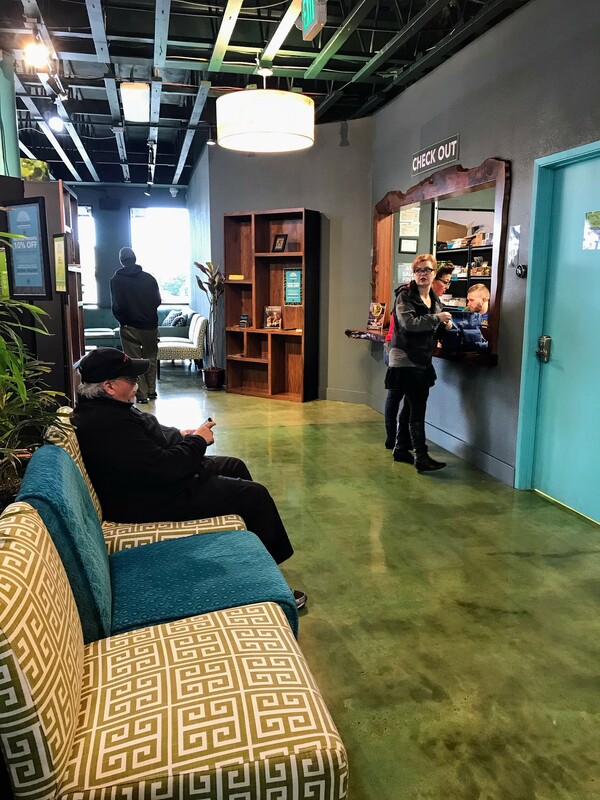 Treehouse appears to be going for the Amsterdam Cafe experience where one can walk up to the counter, order the Cannabis you like as coffee from your barista and consume your order in the cafe. Only, California law doesn't allow that (yet) and customers leave the dispensary with their order in a white ziplock bag. Only registered members of the dispensary can come up to the samples in the center of the room. And only when accompanied by a salesperson, who records their selection on a tablet. Shoppers pick up their order at the pickup counter afterward. Treehouse only accepts cache payments as banks don't want to take on the federal liability of aiding a pot dealer. While pot is no legal in California, it is still illegal federally. Leading the Cannabis Infused Lifestyle Revolution! Helps Restore Balance and Promote a State of Homeostasis. But above all, none of these statements have been evaluated by the Food and Drug Administration. And their products are not intended to diagnose, treat, cure or prevent any disease. The New York Times this week mentioned a Google mailing list for Googlers of a certain age that I'm a member of, in Tech Leaders Are Growing Up (Again). That's a Good Thing. Several years ago, a plastic figurine began appearing around Google's offices, an aging alien with gray hair, a Google Glass headset and a sign that read, "Get Off My Lawn!" 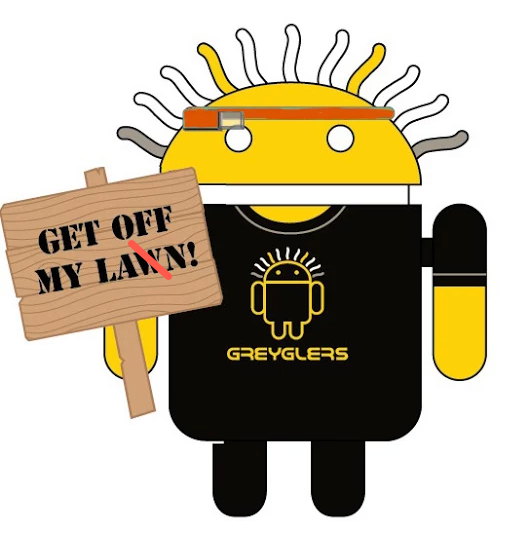 The doll, a special edition of Google's Android mascot, was a jokey tribute to the Greyglers, a group for the 40-and-over crowd at Google, and the doll hinted at how it felt to be an older worker in tech: funny, self-conscious, a little out of place. We almost bought a 24' "used" yurt on Craigslist. It was a pre-owned Pacific Yurts yurt that had never been put up. Tatyanna found it on Craigslist available for parts and the promise of letting them go for cheap. Take it all and receive a discount to boot. Tatyanna arranged for us to inspect the parts on Monday evening. Winter rains had arrived that day and it was raining lightly. Dean, the seller, had the parts stored under a canopy, keeping most parts dry. Still, the wooden door frame had some mild rot. Plus the rafters might have some rot too since they were stored at the edge of the canopy and getting wet. Most of what was stored there looked to be in pretty good shape. It all required cleanup and maybe some repair but didn't look too bad. Dean then took us to another structure where he'd stored sidewall and roof. The canvas sidewall had significant rodent damage all along the bottom edge. To repair this, I would have to replace large portions of the bottom strip. Dean showed us a white vinyl "roof" that looked awfully thin. It was not nearly as thick as the vinyl/polyester sidewall. His Craigslist posting suggested a price of $500-700 for all parts. However, now that we had inspected the lot and things looked to be in better shape, Dean started talking about $1,000 - $1,200. He suggested a closed auction with 2 bidders: us and another interested party. In our due diligence at home, I learned that the white vinyl "roof" was only the liner of the roof insulation. Which meant that the roof was not included and that the roof insulation was missing too. Their replacement cost is around $4,000. 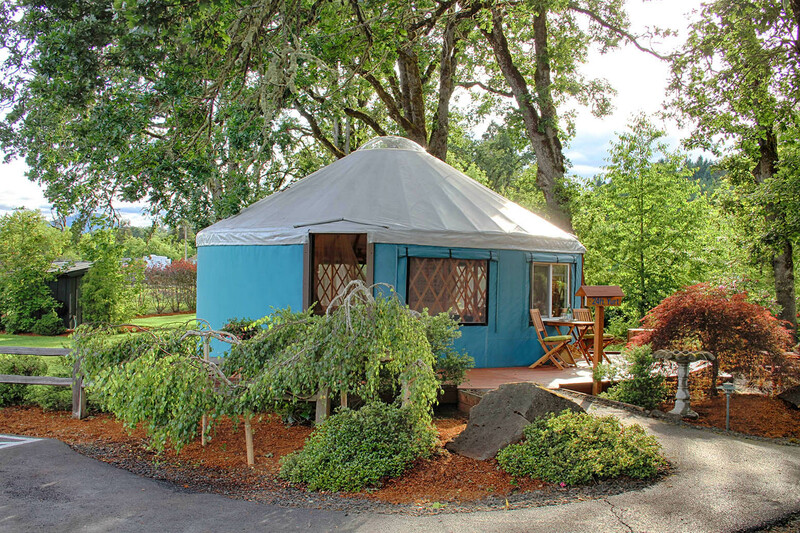 A new 24' yurt runs close to $12,000. Significant savings but still a lot of money. There might be a few surprises waiting for us still, as we hadn't inspected each part up close. The rolled up sidewall insulation, for example, could also have rodent damage. The permit application window for the Wonderland Trail around Mt Rainier opened on Mar 15. One can submit a single application for a Mt Rainier wilderness permit until Apr 1st, 2018. All requests received between March 15 and March 31 will be processed in random order. Accepting alternate campsites. These will be chosen by the park rangers handling our application. Accepting a clockwise or a counter-clockwise route. Accepting a loop without the Spray Park alternate. Starting at an alternate trailhead. The only thing we can not do is start on a different day. Let's hope that a) our application will be processed and b) we're lucky enough to get a permit for our dates. Either way, we'll be out the $20 application fee. This fee will not be returned if the park can't fulfill your request.